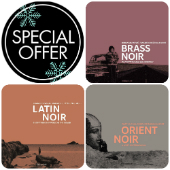 Various - "# 3 Série Noir CDs: Brass + Latin + Orient Noir"
Piranha's série noir transfers the film noir ambiance into imaginary soundtracks. There is a characteristically Orient melancholy, a typically Balkan Brass kind of sentimentality and there certainly is an unmistakably Latin emotionality, both in lust and trouble. Explore all of them with our special offer!